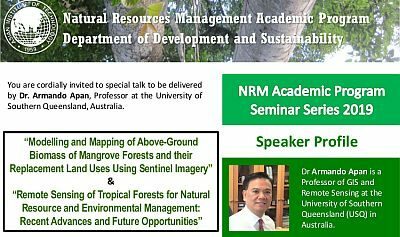 Two talks will be delivered by Dr. Armando Apan, Professor at the University of Southern Queensland, Australia on13 February 2019 (Wednesday) from 13:00-15:00 hours in Room S101, School of Environment, Resources and Development (SERD). Dr. Armando Apan is a Professor of GIS and Remote Sensing at the University of Southern Queensland (USQ) in Australia. A Graduate of AIT in 1992 (Master of Science, NRM), Professor Apan received his BSc Forestry degree from the University of the Philippines Los Baños, and PhD in Geography and Environmental Science from Monash University in Melbourne, Australia. His research interests focus on the application of remote sensing and GIS to observe terrestrial ecosystems and their responses to environmental/climate change; forest vegetation and habitat mapping, biodiversity assessment; land use/cover change analysis; agricultural crop area mapping and yield prediction; and flood and drought mapping. He is the recipient of the Queensland Spatial Science Excellence Award and a Fellow of Australia’s Surveying and Spatial Sciences Institute. Dr Apan was the Associate Dean (Research) of the Faculty of Engineering and Surveying at USQ from 2011-2013. He has over 170 papers published in refereed journals and conference proceedings. 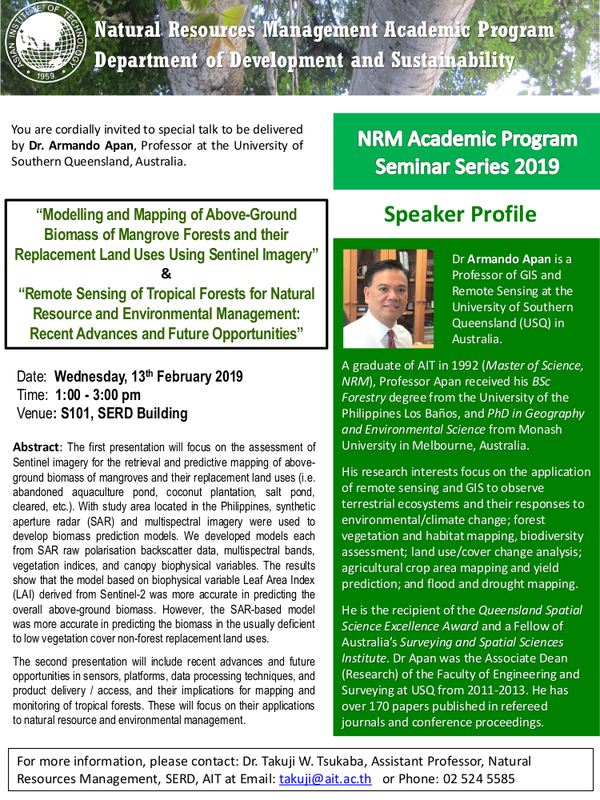 The first presentation will focus on the assessment of Sentinel imagery for the retrieval and predictive mapping of above-ground biomass of mangroves and their replacement land uses (i.e. abandoned aquaculture pond, coconut plantation, salt pond, cleared, etc.). With study area located in the Philippines, synthetic aperture radar (SAR) and multispectral imagery were used to develop biomass prediction models. We developed models each from SAR raw polarisation backscatter data, multispectral bands, vegetation indices, and canopy biophysical variables. The results show that the model based on biophysical variable Leaf Area Index (LAI) derived from Sentinel-2 was more accurate in predicting the overall above-ground biomass. However, the SAR-based model was more accurate in predicting the biomass in the usually deficient to low vegetation cover non-forest replacement land uses. The second presentation will include recent advances and future opportunities in sensors, platforms, data processing techniques, and product delivery / access, and their implications for mapping and monitoring of tropical forests. These will focus on their applications to natural resource and environmental management.